Spectacle and Spectacular! 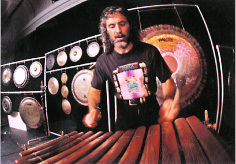 Tony Vacca, internationally renowned percussionist and composer, presents educational programs that are visually stunning and musically simply astounding. Tony has been performing for arts in education programs in schools all over the Northeast for 25 years. Programs range from one-day visits to five-day residencies, professional development, and may conclude with evening community concerts involving students and faculty. Performers range from solo to quintet with a variety of musicians and dancers from the US and abroad. Twice annually Massamba Diop, master tama drummer for Baaba Maal, comes from Senegal, West Africa to tour with Tony. Tony is known for his balafon and gongs in addition to his djembes, dun-dun and tama drum performances. He likes to use his music, spoken word, and rhythm to address topics like cultural diversity and global and social awareness. He enjoys working with students of all ages, and especially middle and high school students. Expect a professional caliber music, very high-energy program with audience participation. World Music: Playing music from more than one musical, cultural perspective at once. We look at and demonstrate combinations of genres, instruments, and languages. Math: The complex polyrhythms played involve practical knowledge of math and geometry. Both principles are used to create a chart from which students learn to read and play these patterns. Science: The physics of sound as demonstrated with music and how instrument shapes affect outcomes. English/Language Arts: We work with, create, and perform poetry or rhythm poetry. Social Studies: We discuss and demonstrate the confluence of cultures at work in America that shape our music and reflect who we are. May also include discussions on slavery, colonization, forced migration, etc. History: Hands-on demonstrations of the impact of West African culture on American language, thought, and music. Multi-Culti Rhythm Ensemble: Participants learn to play a percussion composition. The instruments usually include djembe drum, balafon, tuned bells, shekere, talking drum, gongs, and drum set. Students and faculty work together and all skill levels are welcome. Each participant has an instrument, a part and a voice in creating a band, one of the best forms of teaching teamwork, concentration, and being alert to visual and auditory cues. Math of Rhythm: It takes mathematical awareness to go from the physical power of sound into building sound into rhythm, rhythm into songs, and songs into a powerful experience. We start with call-and-response mimicry and then move into more literal mathematical representations of what makes rhythm so attractive. Using simple symbols and numbers in a graph-paper grid to demonstrate rhythm, syncopation, and polyrhythm, we then apply it by “writing” out and reading rhythms that we invent, weaving them into a short composition. The goal is to create an awareness of the clarity and exactness required for a rhythm to be effective, and for the player to comprehend how it is built. This leads to discussions of sequences, patterns, and fractions demonstrated with concrete examples. Science of Sound: We explore the nature of sound and vibration in the creation of music and the powerful effects that the sounds we call music have on our bodies and minds. Using giant Paiste gongs to demonstrate vibrations so huge that you can hear, see, and feel them, we create a gong composition to apply and experience what we have discovered. Basic principles of physics, sound waves, instrument size, and construction are some topics discussed. Rhythm, Word Drum: In this workshop we create poetry and spoken word pieces together. We then add music and/or chant around the words and see what develops. We demonstrate, teach, and encourage participants to call on, test and develop their language skills and their understanding of the rhythm-word connection. Find your voice, tell your story, know your history, and embrace your responsibility to yourself and your community. This is a lot of fun with teachers! Professional Development: Adaptable from “especially for music teachers,” to helping select instruments and African drumming curriculum, to providing tools that classroom teachers with no music background can successfully and comfortably use with their students. Tony’s newest CD, Senegal America Project has been released containing the music we recorded in Senegal in 2006 and a second CD is due out soon. Click here to check out Tony Vacca's web site.